Being a greeter is the best job in church! The greeter at church asked me how old I was and I told him I was 21. Tomorrow I’m a greeter at my church for the first time ever. YIKES. Your greeters may need some practical tips on making a great first impression, and some skills on how to welcome people. The following article by Brandon Cox appeared at Faith Village (update: link broken) and is re-posted with author’s permission. 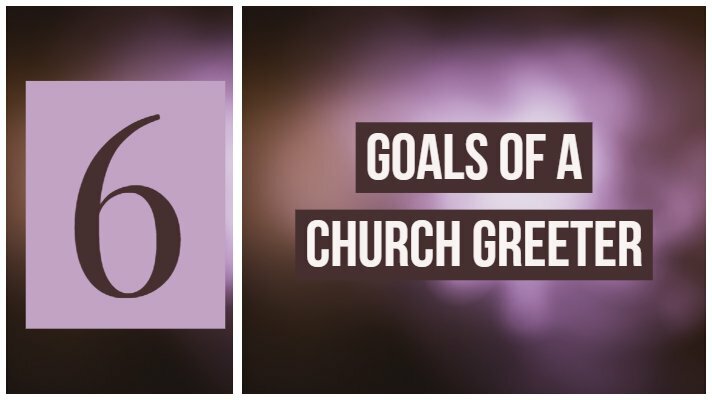 In it, he gives you 6 goals of a church greeter you can use to help your church greeters make a better first impression. No matter what your philosophy of Sundays in the life of your church looks like, it’s always biblical and beneficial to show love to people who are walking through the doors for the first or second time. In fact, it’s crucial. It’s very easy to come across as either disingenuous with an “in your face” approach, but it’s equally easy to seem uncaring by our silence. Last Sunday, my wife noticed a new kid in kids’ worship. Two other boys belonging to one of our core families walked up to him and asked him if he liked video games. Upon hearing his enthusiastic “yes” they replied, “Good, you can be in our group then.” The kid belonged already, evidenced by his smile. God showed His love for people by sending His Son to die for our sins. Are we willing to love people enough to intentionally show it with our actions? And by the way, if you’re a believer, you’re a greeter at your church whether you’re signed up or not. Brandon Cox is Lead Pastor of Grace Hills Church, in northwest Arkansas. He is also Editor of Pastors.com and Rick Warren’s Pastor’s Toolbox. Catch him on Twitter@brandonacox. I want to thank you Sir for this great insight, am bless. God will replenish you spiritual and physical.